Enviromission of Australia wants to build a $342million 200 MW "solar chimney" in southwestern New South Wales. When complete, the structure will be just short of 1km high, almost twice as high as the tallest building in the world. The "solar chimney" would feature a large greenhouse covering 13sqkm. As the hot air rises, it would escape up a 990m tower in the centre of the structure. Wind turbo-generators mounted in the chimney would convert this 50km-an-hour rush of hot air into electricity. Enviromission's proposal has yet to be approved. A demonstration protype was built in the 1980s in Spain which ran successfully for two years. 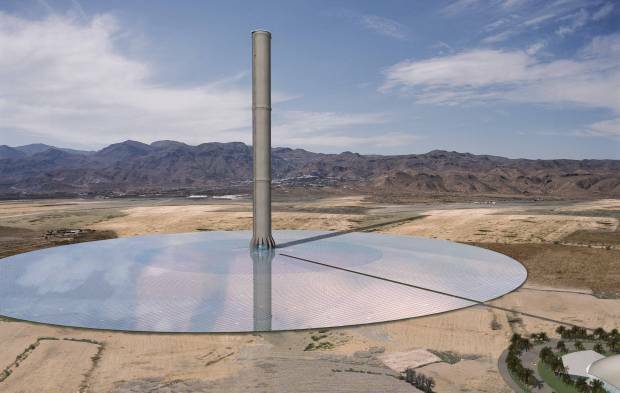 If built the Australian solar chimney will be over 40 times bigger. The great thing about this concept is it can run almost constantly not just when the sun is out. I hope this gets approved fast these are the kind of visionary projects we need to replace fossil fuels. But I agree, this is the kind of new paradigm thinking we need in the coming years. Excellent idea. Has anyone completed an efficiency model or cost analysis? While this might be an eyesore to some and would definitely have an environmental impact on whatever desert it displaced, 13 square km is not that large an area. This sounds like a great opportunity for Southern California, which has a good amount of desert to utilize and could definitely use the extra power production capacity. I only wonder mainly about the temperature that may be generated in the process, as if the 50km per hr. wind that will be harnessed will be hot air and the possible effect on global warming.